This Jack Russell puppy cake is made out of a vanilla madeira type cake and carved into the shape of the dog, lying down, gluing the pieces together with vanilla buttercream. 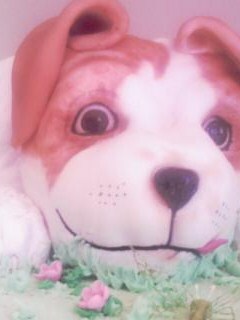 The entire dog is then buttercream iced with vanilla buttercream. The dog's nails are made with pink modeling paste. The name tag is made out of pastiallage and the buckle for the collar is also pastiallage painted silver. The nose is modeled from black modeling paste and overpainted to make it look wet with a mixture of melted gelatin and glucose. The tail is made of sugarpaste and fixed onto a toothpick and attached to the cake once it is dry and the cake has been covered with sugarpaste. Use a little of the cmc glue here as well to make it stick fast and make it curl a little to give the dog some cute personality. The eyeballs are modeled with white modeling paste or sugarpaste and painted in irises once dry. Place the buttercreamed cake (thin layer of buttercream) onto the cake board. The eyeballs are placed into the sockets and fixed into position with some royal icing behind them. The entire cake is covered over, once crusted, with white sugarpaste and carefully moulded around the carved cake into a dogs shape. Bits of sugarpaste are placed over the sugarpasted cake in places and using a veining tool, mark the sugarpaste to look like fur. Glue the nails and insert into the toes which have been shaped with the veining tool. Cut out the sugarpaste to reveal the eyes and form lids around the eyeballs with your fingers and the veining tool. Make the ears out of modeling paste and leave them to dry over sponge. Make a pink or blue dog collar out of sugarpaste after the chain and the buckle and dog tag are painted and all already dry. Make a chain out of sugarpaste and paint it silver. Attach the tag with the dogs name painted on in food colour or iced on in royal icing to the buckle and leave it to dry. Loop the collar through the dry buckle and glue into place around the dogs neck, allowing the dog tag to be readable and resting on the dogs shoulder. Dust nut brown patches onto the dogs body and ears with dusting powder and a paintbrush. Use a black icing pen to outline the eyes and black royal icing to ice the mouth. Attach a pink tongue made from sugarpaste. Make depressions into the sugarpaste for the whiskers. The ears are attached with cmc and gin mixed into a glue. ice the board with grass in green royal icing and paste blossoms and butterflies onto it. Dogone it you are done! Congratulations on a really special craetion . The realism is truly stunning ; the expression on the pup's face is enchanting ! A super job ! That is the cutest puppy cake I've ever seen! You did an amazing job!!!!!!!!!! !